Post 1000 will be uploaded at 8PM EST. I can't wait for the next post. I am halfway through Kiki Strike: Inside the Shadow City, and I am loving it! Thanks to Lioness for telling me about these books. WOOT!!!!!! Just because you said that I'm not going to watch the super bowl I'm going to check Kiki Strike.com every minute from 7:45-8:00 est. time! Thanks for not letting me watch that torturest super bowl!!!!!!! Ditto, gymnast20. Actually, I have a conflicting thing tonight anyway. But I get home around 8! oh boy!!!! this is so cool! i can't wait! i wonder what kirsten has in store....go colts! That summarizes moi right now. I don't get football either. i'm excited! but a little disappointed that i have a volleyball turnament from 3 to 8.
i had to get up @ 5:25!! i'm practicing my Ancient Yurik. I have a test tomorrow. 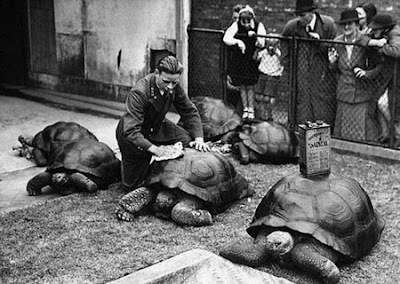 oh, is that a picture of someone windexing a tortoise? This all makes up for me having to trudge through my GIGANTIC unplowed hill of a driveway through at least three feet of snow with flats that kept falling off. I was at my cousins wedding, which was supposed to be in an OUTSIDE tent (it was a bunch of sturdy structures, not camping tents!) but the tent was ripped to SHREDS. We had a makeshift wedding in her mother's house across the street, and it was marvelous. My family snuck (or sneaked??) into the tent and it was beautiful, until we got to the shredded one. It was like the titanic, all the bars still had the cups neatly in place, the tables had their red tealights waiting to be lit. Hmm I wonder what it will be. i hope it will be the cover of the new book!!!!!!! or an excerpt!!!!! Mushroom Cloud: What's Ancient Yurik?